NetAdvantage for LightSwitch does not have a Silverlight 5 option, and will not until Silverlight 5 is supported on that platform. Select the Custom Upgrade button. Note: If you are coming from 2010.2 or earlier you will need to upgrade to Silverlight 4 first to handle the renaming of assemblies/controls that occurred in 2010.3. Note: the Platform Installer will continue to install the Silverlight 4 assemblies. If you want to use Silverlight 5 assemblies, you need to explicitly download the Silverlight 5 package from the list. 2011.1 controls are not built with the Silverlight 5 SDK, we will continue to ship these as Silverlight 4 only controls through their support lifecycle. We have however regression tested all of the 2011.1 controls against the Silverlight 4 runtime and Silverlight 5 runtime. With the exception of NetAdvantage Reporting, the 2011.2 controls will ship with both Silverlight 4 assemblies and Silverlight 5 assemblies. Silverlight 4 assemblies are tested against the Silverlight 4 runtime and Silverlight 5 runtime. Silverlight 5 assemblies are tested against the Silverlight 5 runtime. 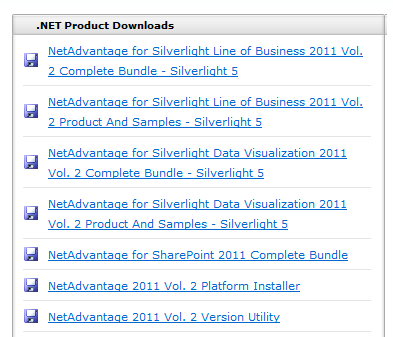 NetAdvantage Reporting will only support Silverlight 5 from this point onwards. Beginning with the February 2012 Service Release, we will only patch ship Silverlight 5 compiled assemblies for 2011.2. Silverlight 5 Service Releases will be available as separate downloads via MyIG on infragistics.com. When 2012.1 ships in early Q2 2012, we will only ship Silverlight 5 compiled assemblies, with the exception of LightSwitch, which will continue as Silverlight 4 until Microsoft updates the SDK and runtime.